A third Longmorn for Whiskyrific – must be something good going on with these old casks. 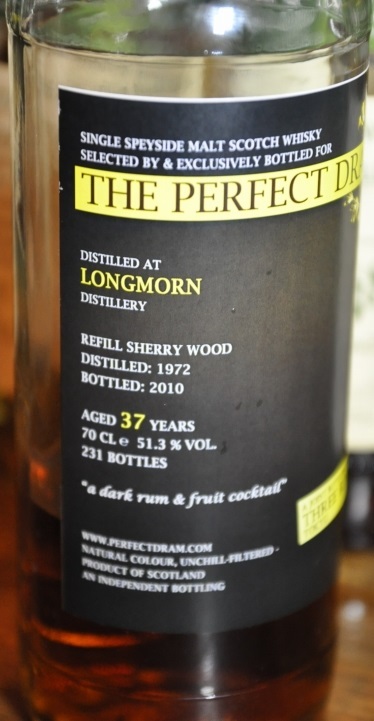 Longmorn 37 yo 1972 / 2010, The Perfect Dram & Three Rivers Tokyo, Refill Sherry Wood, 51.3%, 231 bottles. Nose: Smells fantastic already. Sun dried dark fruit, assorted crystallized ginger and pineapple, coffee grounds, old plant resins-that particular old resinous note that hints of delicious tannic astringency. Seasoned leather, old wood and cracking lacquer, prune juice concentrate. Old brown paper and crayons lurking around too. With water: brighter fruits – more berry ‘fresh’, and black tea. More dry wood. Palette: Sweet and immediately complex, revealing loads of dark fruit yet quite fresh – more fruit medley than fruitcake. Nutmeg and black pepper is there, and old dry wood. Wonderfully matched with a herby dryness. Mouth watering! Drier and drier as the sweetness recedes and the tannins assert themselves with an iron grip. Becoming more spiced towards the finish. With water: Sweeter and milder. Fruit is juicier. Finish: Long, dessert spice and hints of preserved plums. Excellent balance and expression. Twirls a perfect pirouette on the tongue. Really quite beautiful. Am I unrealistic if I expect this from old Longmorn? This entry was posted on May 5, 2014 by Whiskyrific in Longmorn and tagged Longmorn.